← Sale-a-bration is nearly here!!! I am so excited about the launch of a new Challenge Blog – and focusing on Stampin’ UP! products! yay!!! 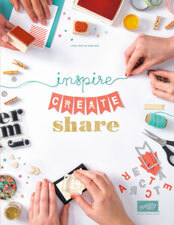 of course all products are welcome but to see lots of new ideas with stamp sets I might actually own is just fab! JUST ADD INK (click this link and check it out) is run by a bunch of Stampin’ UP! Demonstrators and I can’t wait to see what they will come up with every week! I chose to play with a square card today, and couldn’t resist using stampin’ pastels because the taken with teal is really pretty when softened like this. i like to use the applicators that come with the pastels as they give a subtle, blended look to the colouring. The stamp set I have used is Embrace Life, and I have added a so saffron DSP mat to the central image. 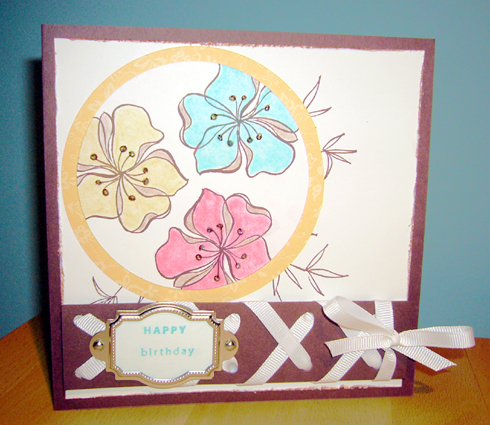 I stamped in Chocolate Chip Ink and added an understamped layer of branches from the same stamp set. My sentiment is from the Occasions for All hostess stamp set (so useful) – and this is highlighted by some hodgepodge hardware. The ribbon is Whisper White Grosgrain. Dont forget to pop on over to JUST ADD INK and leave some comments for the fab design team and all the other crafters joining in for this weeks challenge! I know I will be checking this great challenge blog out EVERY WEEK! Hi Jan, great card. Love the lacing. Thanks for joining us at Just Add Ink! What a beautiful use of the pastels – just gorgeous! 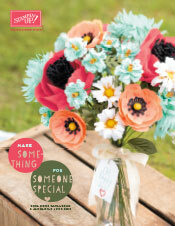 I love how you’ve spotlighted the flowers and the ribbon feature is so sweet (I’ll have to try that one). Thanks for visiting us at Just Add Ink! Wow! Love your card! A great way to use the colours by using the Stampin Pastels and the Hodgepodge Hardware and Ribbon detail is just gorgeous! Great job on the challenge! Oh, this is great, lovin that ribbon work! Hello Jan! I love how you have coloured the flowers with pastels. I don’t use mine enough. Your card IS elegant as your lovely blog name, suggests! Thanks for participating in Just Add Ink’s very first challenge. Yep me too love the pastels and spotlighting.